I went to the Sacramento Kings versus Dallas Mavericks NBA game. Wanting to see Doncica play and go to a game in March, I bought a single ticket (Section 111, Row L, Seat 15) a couple of months ago. Larkin also ended up buying a single ticket for the game (Section 111, Row H, Seat 9). Both teams seemed flat in the first half. Leading 53 to 51 at halftime, the Kings outscored the Mavs by 6 points in the third quarter and 8 points in the fourth quarter. The Kings won the game by the score of 116 to 110. In his first start for the Mavs, former King Justin Jackson was the high scorer for Dallas. He had 19 points on 9 for 16 from the field, 1 for 6 from three and 0 for 1 from the free throw line. When he was in the game, I focused on Doncic. I was a little disappointed that he only played 26 minutes. Doncic was 4 for 19 from the field, 2 for 10 from three and 3 for 5 from the free throw line. He added 10 rebounds. Doncic is listed at 6' 7" and 218 pounds. I was shocked to see him guarding the Kings small forward. Mostly Doncic was guarding Barnes, but also spent some time covering Bagdonovic and even Bagley at one point. It is clear that Doncic and Bagdonovic know each other and have some kind of relationship. In his farewell tour, Nowitzki played 13 minutes. He scored 3 points on 1 for 5 from the field and 1 for 2 from three. Nowitzki looked like he literally couldn't run. It was painful watching him move up and down the court. Buddy Hield was the Kings leading scorer. He had 29 points on 10 for 21 from the field, 7 for 13 from the three and 2 for 2 from the free throw line. Hield needs three more threes to break the franchise record of 240 set by Peja Stojakovic in 2003-04. When Doncic wasn't in the game, I focused on Bagley. I am amazed at how high he can jump! Snipes and Keith were also at the game. At half-time, Larkin and I wandered over and talked to Snipes. I continue to be crestfallen that I had to cancel my Spring Training trip. 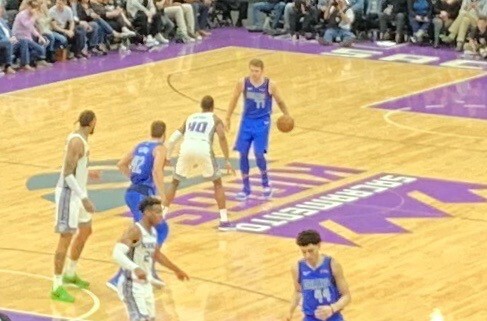 The Kings now have 6 wins and 2 losses in games that I have seen in person during the 2018-2019 season.